Powers/Abilities: Superhuman strength, able to fly, amphibious, able to swim at incredible speeds, bulletproof. Has access to advanced Atlantean technology and various giant monsters of the deep. History: (Motion Picture Funnies Weekly #1, Marvel Comics #1, ga) In the early 1920s the Atlantean nation was living under the Arctic ice. When American ships began to intrude on their kingdom, King Thakorr's daughter Princess Fen decided to spy on the surface dwellers. Captured, she fell in love with the Captain of the ship, Leonard McKenzie. They married almost immediately, and Fen swiftly became pregnant. However she was appalled when the Americans started blasting the ice, reigning destruction down on her people, and she fled back underwater. Months later she gave birth to a white-skinned son (the Atlanteans were normally blue-skinned), whom she named Namor, "Avenging Son" in the Atlantean tongue. She raised him to hate the surface people. When he was twenty, he killed a couple of divers, believing the suited individuals to be some kind of robot. After discovering they had been living men, Namor was sent to the air-breathing world to forcibly teach them not to intrude on Atlantis. (Marvel Mystery Comics #2-91, Human Torch #1-33, Sub-Mariner #1-32, All Winners Comics I #1-18, Captain America #20, 68, 70, All-Select Comics #1-5, 10, Kid Komics #4, Daring Comics #9-12, ga) Though he initially rampaged through New York, and fought other super-powered beings, such as the Human Torch, Namor's attitude towards the surface people gradually became more peaceable, in large part due to a friendship he struck up with Betty Dean, a NYC police officer. 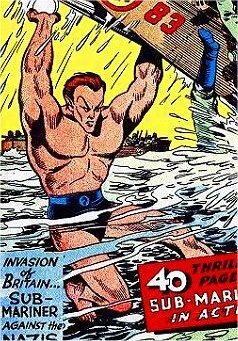 When German forces intruded on his undersea home, Namor began to fight the Axis forces and work with the Allies. (Invaders I #1-41, Invaders II #1-4) Namor joined the Invaders, a team of Allied superhumans. (What If? I #4) In 1945 the Invaders were shocked to learn of the apparent deaths of Bucky and Captain America, blown up over the English Channel. (What If? I #4) The Sub-Mariner was present when the android Adam II attempted to assassinate a young and up-coming politician, a fight in which one Captain America lost his life (the Spirit of '76), and another took up the mantle (the Patriot). (Blonde Phantom #13-15, 17-22, All Winners Comics v2 #1, Namora #1-3, ga) No synopses available. (Tales to Astonish I #101, fb) Around 1955 Namor fought Paul Destine, a human granted great mental powers through the mystical Serpent Crown. Destine, or Destiny as he preferred to be called, wiped Namor's memory, leaving him an amnesiac down-and-out in New York. Destiny then used his powers to destroy Atlantis, though most of its people managed to flee the destruction of their city. (Marvel: The Lost Generation #3, 7) Circa 1961 Namor was found by minions of the Yellow Claw. Recognising the potential value of his discovery, the Oriental mastermind brainwashed Namor into his service. Disguised by armour, he fought the First Line, before breaking free of his conditioning (but not his amnesia). (Fantastic Four I #4) After decades of amnesia, Namor was discovered in the Bowery district by Johnny Storm, the new Human Torch. Recognising the Sub-Mariner, the Torch helped him break his amnesia by dropping him into the sea. (post-FF I #4) Initially Namor believed the destruction of Atlantis was the fault of surface world atomic tests, and sought revenge for this. Eventually he discovered the truth, and was reunited with his people. Since then he has mostly been a hero again, often working with groups like the Avengers or the Fantastic Four. He is currently a member of a new team of Invaders. Comments: Namor actually pre-dates Timely Comics (as does Ka-Zar), having first appeared in a cinema give-away Motion Picture Funnies Weekly #1. His original adventure was subsequently reprinted and expanded in Marvel Comics #1. Thanks to Jess Nevins for allowing me to use information from his excellent Golden Age Heroes Directory and his Guide to Golden Age Marvel Characters. Thanks also to Richard Boucher & Darrin Wiltshire @ PR-Publications for permission to use information from their equally brilliant collection of Golden Age Sites, PR Publications. Their knowledge of Golden Age characters far outstrips my own. Thanks to Brad Newman for permission to use images from his Comic Book Cover Quest site on this page. Subbie, a younger but similar character with no known connection to Namor.